Just a couple weeks ago, there was a day in mid July where storm clouds were rolling in from the west, I made a cup of tea just so I could wrap my hands around something warm and I briefly debated lighting the wood stove to take the chill out of the air. I’ve lived in Ireland for 12 years and I usually don’t let the weather get me down — I know full well by now how disappointing Irish summers can be, weather wise — but that day was so grey and cold and dismal that I was close to tears. It might not be much of a summer most days, but we do get a nice surprise every now and again with a day that’s sunny and over 70°F, and on one such day I made this salad — and liked it so much that on the next warm, sunny day, I made it again. The chicken could be grilled on a BBQ or grill pan instead of roasted in the oven. The avocado dressing (adapted from Mexican Everyday by Rick Bayless) makes the salad more substantial and filling, but if it seems like too much work, try this lime‐garlic dressing and simply slice 2 avocados and add them to the salad instead. And speaking of too much work, you could use jarred roasted peppers instead of roasting fresh ones yourself too. Whisk together the lemon juice, olive oil, chilli powder, smoked paprika and a generous pinch of salt and freshly ground black pepper. Place the chicken in a glass bowl or ceramic dish and pour the marinade over. Cover tightly and place in the fridge for at least a few hours, or ideally overnight. When you’re ready to cook, preheat the oven to 400°F (200°C) and transfer the chicken to a baking sheet, trying to keep as much of the spices on the chicken as you can once you remove it from the marinade. Sprinkle over some salt and freshly ground black pepper and roast the chicken for 25 to 30 minutes, or until cooked through. Meanwhile, to make the dressing, add all the ingredients to a food processor or blender. Process until smooth. Toss the shredded Romaine lettuce with some of the dressing, making sure all the lettuce is coated. Divide the lettuce between 4 plates or large salad bowls, then scatter over the roasted peppers, halved cherry tomatoes and red onion slices, finishing with the feta cheese. 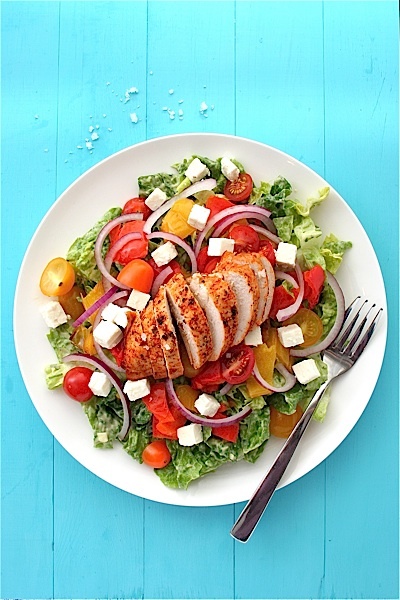 When the chicken is done, slice each breast into thin strips and place on top of the salad. Spoon over some additional dressing, if desired, and serve right away.